It’s Coming… But Not Yet. Friday Teaser! So you remember last week, how we talked about that winter bird singing through the snow and how we can sing against the odds, and then I told you that this week I would have a really! exciting! announcement! to make? 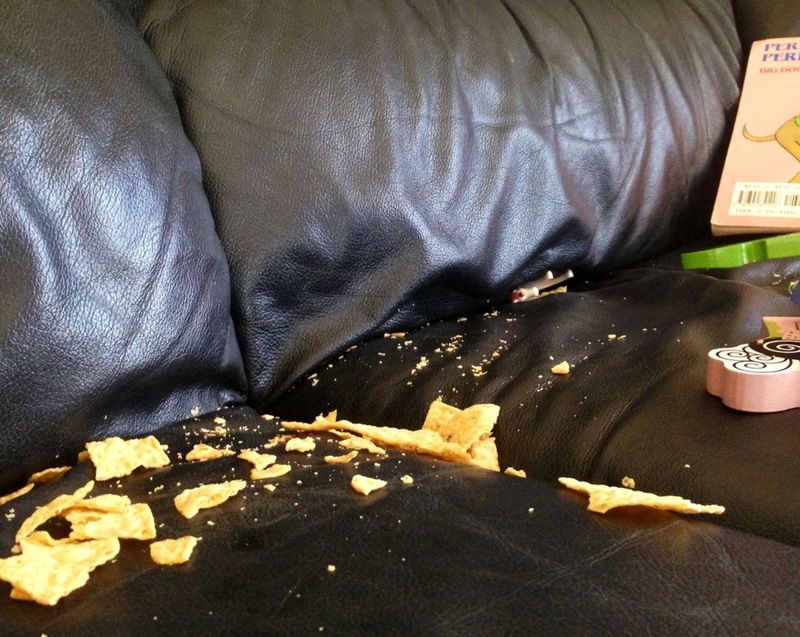 The good news is that the planned announcement has nothing to do with tortilla chips that were surreptitiously smashed into my sofa. The less-good news is that these chips represent an extra-chaotic week, and the full reveal is just plain not ready. I’ll just go ahead and assume you weren’t planning your WHOLE week around this announcement and save the kleenex for another time. But how about a little hint to tide you over? Full reveal coming soon, I promise. 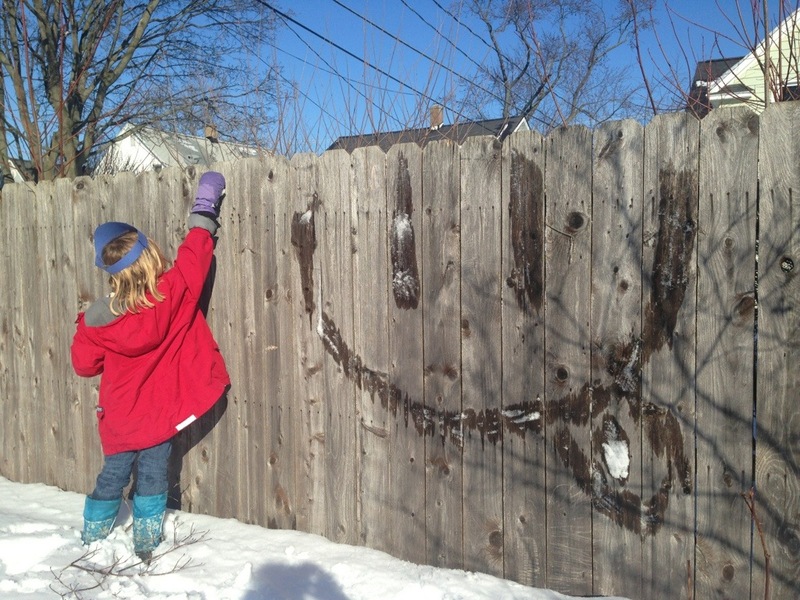 In the meantime, step outside this weekend, find yourself something beautiful, and enjoy some good winter fun. Yes, Canadians, this one is all about you. We’ve noticed: you’re spectacular (also, you do let us know). So, here are a few more things for you to brag about, eh? Winnipeg is a city to watch. All this and tilted trash cans, too. Winnipeg, you’re on my map. If you’re going to do it, then do it right. As Winnipeg rolls out new bike infrastructure they’re doing more than most North American cities to follow established best practices, rather than just slapping some paint on the pavement and calling it a day. Let’s be clear from the outset: Winnipeg hasn’t arrived. Like most North American cities, dangerous gaps remain in their bicycle infrastructure and they have many miles to go to go before they reach the gold. But there are flickers of hope. Last winter, world-renowned bicycle consultant Mikael Colville-Andersen visited visited Winnipeg and saw promise. 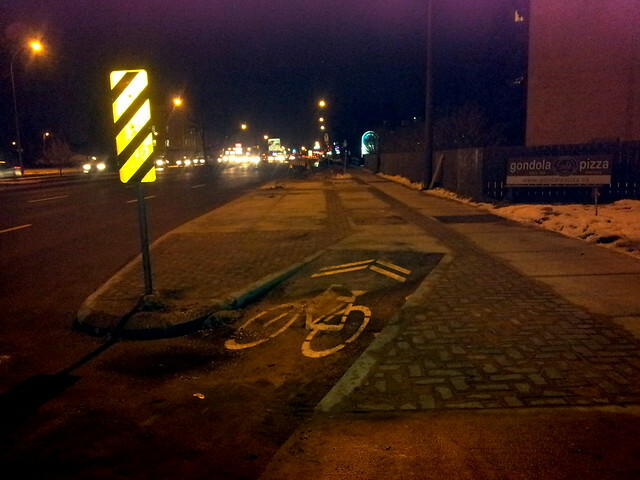 A Winnipeg bike lane goes around a bus stop so the bike rider doesn’t need to veer into traffic to pass a stopped bus. Image courtesy of Copenhagenize.com. In the example above, the bike lane is routed around the inside of the bus stop so the rider doesn’t need to veer into traffic to pass. Brilliant – and uncommon on these shores. In Winnipeg? Try out this map (in beta) to get you where you need to go by bike. I was working when I started riding my bike for transportation, and traveled exactly one route day in and day out. Now that I’m ranging a little more widely, I’m doing the sometimes-fun-exasperating-frightening route-finding task. Around here, a bike route might hop back and forth across a five-lane road, be washed out by a rain, disappear into an expressway, or wind through a beautiful park. You never know what you’re going to get! If you’re living in (or visiting) the fabulous metropolis of Edmonton, check out Miss Sarah’s start on a collection of great routes to ride. Taking the guesswork out of route-finding – a solid win. Vancouver. Whoopdeedoo. No, really – Whoopdeedoo! Bike commuting just got a little more fun in Vancouver, with the Whoopdeedoo. Image courtesy of the Atlantic Cities. In places where bike infrastructure is taking off, there tends to be something of a sound and fury between people who drive cars to get around and people who ride bikes to get around. So this artist thought: let’s lighten up, eh? Entering stage left: the Whoopteedoo, in Vancouver, British Columbia. Read more about the Whoopteedoo in the Atlantic Cities article here or Greg Papove’s website here. And have a Whoopteedoo weekend. Killing time? Check out a couple popular Friday Fun day posts from the archives, including Doing What’s Easy and an eclectic early round-up. On a whim, I visited the Holland City Council meeting on Wednesday. Among other things, there was a lengthy discussion about whether to install a new No Parking sign on a corner near Jefferson Elementary School. One of the interesting points of discussion was the neighbors’ objection to teachers using street parking rather than the parking lot – there were several references to “the nice new parking lot we just built them.” It’s an interesting relationship we have with the public streets in front of our homes, isn’t it? We have really wide streets in Holland. We’re using using public dollars to maintain them. So. Hm. Anyway, this was not the main thrust of the conversation, and consensus seemed to be that congestion and visibility in the area were the biggest issues. I have to say, though, that I’m not sure that solving those problems will bring us the desired result. I tend to think rather that the biggest problem is speed and the expectation of speed. We’ll probably take a look at this again soon – what do you think? He EARNED this. Click for image credit at original site. This crazy idea turned into a great community asset. I love it. In a video on their website, she says, “It worked, and I can’t believe it worked.” What an awesome way to build up a city! Andrew Spidahl in India. Click photo for original article and photo credit. I get that crazy itch to travel just reading about this amazing adventure. A intrepid group of six friends went on a bike tour for the ages: they pedaled their way from Germany to Thailand, motivated to see the world, connect with regular people, and not use a lot of fuel to do so. Click here to learn more about their adventures, but be warned: you may be compelled to purchase a plane ticket if you look at the pictures! I love these unconventional around-the-world travel stories. One of my favorite documentaries is the Ewan McGregor flick Long Way Round, where he and a friend go on a similar adventure. A while back I posted something on Facebook about heading out on the bike to bring my daughter to preschool, and one of my friends cautioned me to be careful. Later that day, I was driving the same route when an oncoming semi started drifting into my lane. It wasn’t a close call – he was still a few hundred meters down the road. But those things are so freaking big that there was nowhere I could have gone to escape if that dingbat driver hadn’t corrected course. So – perspective. Traffic is dangerous. Riding bikes is fun. Walk out the front door at your own risk. A while back, I ran across this documentary by a very passionate advocate for the preservation of Irish Gaelic as he attempted to travel through Ireland speaking only Irish. Interesting stuff – discouragingly enough, it turns out that nobody in Ireland really speaks Irish – but on one occasion he does successfully rent a bike in Gaelic. It’s kind of fun to see him ride the streets of Galway, which are so very, very different than our own. (He starts his ride at around minute 16 following the link above.) And at around minute 22 of this episode you can see him driving an Irish highway. I don’t know if this is typical, but it’s an interesting point of comparison to our eight-lane WAHHH WE NEED MORE LANES behemoths. On that note, have a wonderful walkabout weekend! Fun This Weekend! A Race, Kids’ Bike Fun, and Free Tickets to Dutch Village! Someday we’ll get back to a regular posting schedule around here. Someday after the excitingDinner and Bikes (get your tickets!) evening has wrapped up, and children have shed all the forms of pestilence that have befallen them this week. Someday! But today, an exciting event and a great deal! Let’s start with the exciting event. The Queen’s Day Criterium will happen in Holland on Sunday! A criterium, as it turns out, is a fast bike race. Come and wear orange (for the Queen’s birthday!). The Holland Sentinel did a great write-up of the event here. I was hoping to ride our bikes into town to participate, but we’ll be running off to participate in the CROP Walk Against Hunger that afternoon so the kids’ bikes will have to be tucked into the back of the minivan. It’s going to be great fun nonetheless. I hope to see you there! Next, the great deal. Beginning at 10:00 a.m. this Saturday, April 27 is Nelis’ Dutch Village Seventh Annual Food Drive. Bring one non-perishable food item, and receive a free 2013 admission pass! Those suckers aren’t cheap. You can get one pass for each person-food item pair that you bring, so make it a family outing. 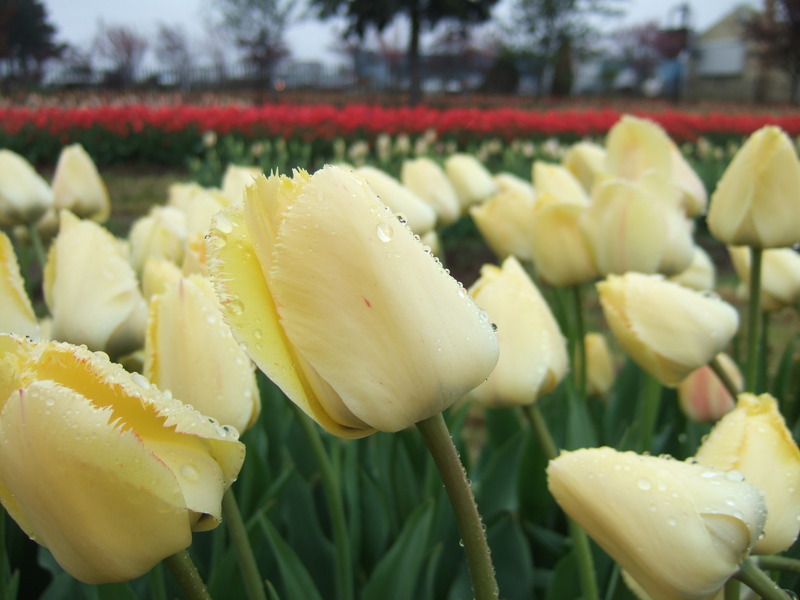 It’s almost Tulip Time – go get your Dutch on! First of all, I have a very exciting announcement to make – and the reason why this blog has been so quiet! Dinner and Bikes is coming to Holland! 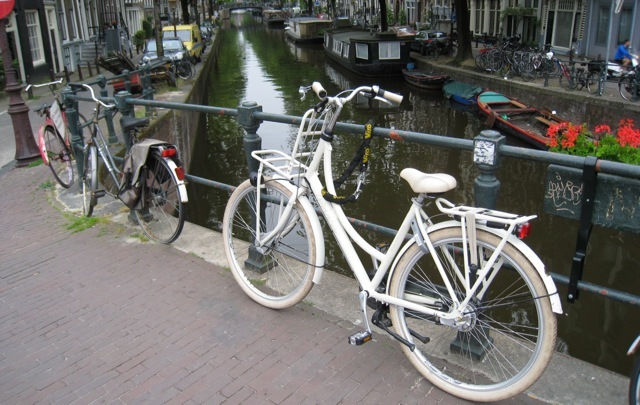 Dinner and Bikes is coming to in Holland! It’s happening on Friday, May 3 – yes, right on the cusp of Tulip Time – at Velo City Cycles here in Holland! It is going to be SO. MUCH. FUN. Tickets are $10 and you can buy them here. Space is limited, so get yours right away! I can’t wait to see you there! You can follow the event on Facebook, too. A kaleidoscope of bikes: drop-off time at Rosa Parks school in San Francisco. This school in San Francisco has developed an amazing bicycle culture! I can hardly even imagine a line of bikes at our daughters’ schools at drop-off time, but this encourages me – it can happen here, too. If you’re wondering how to transport multiple kids on bikes, just take a look at this picture: the familiar trailer, but I also see a couple long-tail bikes, a TrailGator, and what looks like it might be a mid-tail. If you’re curious about this whole “family bikes” thing, click on this picture to get to the original article, then click on the photos there for a closer look. It’s some pretty cool, pretty inspiring stuff. 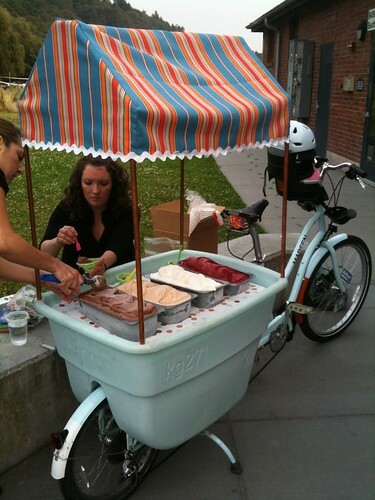 I’d love to see one of these replace the sometimes-sketchy ice cream trucks that fly through our neighborhood! A pretty pink longtail carrying two. Finally, from Family Ride, a longtail bike carrying two. You can click around her bike for loads more pictures on different kid-and-bike set-ups, too. And that’s it for now! It might be quiet around here for a little while longer, but I do hope to be back next week. Have a great weekend!